Ziricote is famous for it’s “landscape” grain pattern, which swirls and billows much like an ancient Chinese landscape painting. 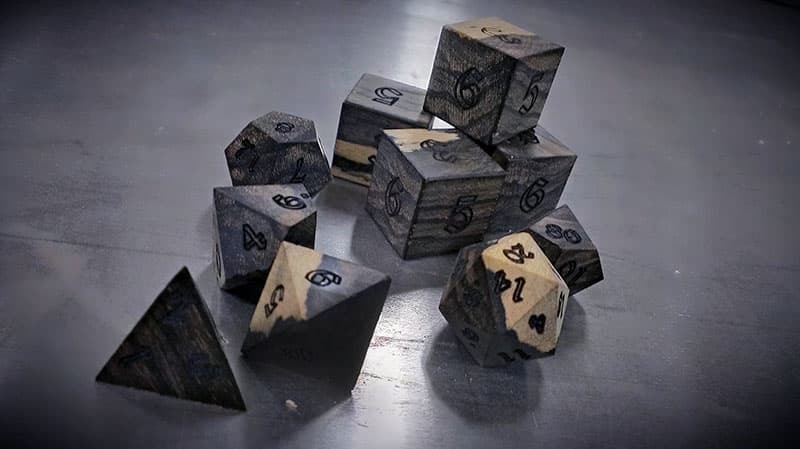 It is a very hard, dense wood that is prone to tear out during the dice making process which makes it a giant pain to work with, but the results speak for themselves. The dark swirling grain patterns make Ziricote dice some of the most beautiful dice we produce. And the rare sapwood contrast really sets off the dark swirls in the dice. Ziricote has a dense glassy tap tone making these dice quite musical when rolled much like the finer Rosewoods. This also makes Ziricote quite sought after for high end musical instruments. Ziricote makes for some of the best wooden dice in the world. Note: Ziricote can range from brown to grey in tone with its characteristic dark swirls. The above photos is a representative photo only. You dice will NOT look exactly like the pictured set. And they will NOT have the sap wood contrast. Any chance these will go on sale, polyhedral-y speaking? yup they are for sale. just fixed the order options. What would the price on a full set (fudge, sixes, and polyhedrals) be of this the Ziricote? So these are available for order now, do they bypass the KickStarter Queue? Compared to the kickstarter, the difference here would be one wouldn’t get the dice box? No difference you’d still get a dice box it will be douglas fir. and i have a set ready to ship so they would by pass the kickstarter que. Will you ever off these WITH sap wood contrast? Also, have you ever considered making dice cups (such as the basankia sead pod dice cup pictured with your Red River Gum set)? sap wood is not available very often, we do get it in from time to time. and yes we can make you a basankia seed pod dice cup. Awesome. I’ll be in touch soon. say is it possible to get some of this laminated between bloodwoodand made into dice?